We are on day two and the second keynote was a success. Before the keynote started, there was a DJ in stage playing some cool music while people entered the room, you can see a short video here. Today’s keynote was all about Windows Phone 7, Silverlight 5 and Kinect, which by the way, every attendee received a new Kinect from Microsoft, sweet! Joe started by inviting this 24-year-old to stage who created a fan video for Microsoft’s Windows phone 7, it is a great video and you can check it out here. Joe mentioned that if enough people tweet about this video that Microsoft will consider making this video into a TV ad, so go ahead and start tweeting. The day 2 keynote started with an update on Windows Phone 7 (WP7) updates. Joe mentioned that many people have complained about WP7 updates and so Microsoft will be more clear as to what updates will include and when these are going to be released from now on, it is a work in progress Joe Belfiore said. Microsoft is still trying to figure it out the best process to get updates to the public in an efficient way. And at the same time Microsoft is doing this by improving the communication with WP7 users and developers, and I agree, it is all about having good communication, isn’t? 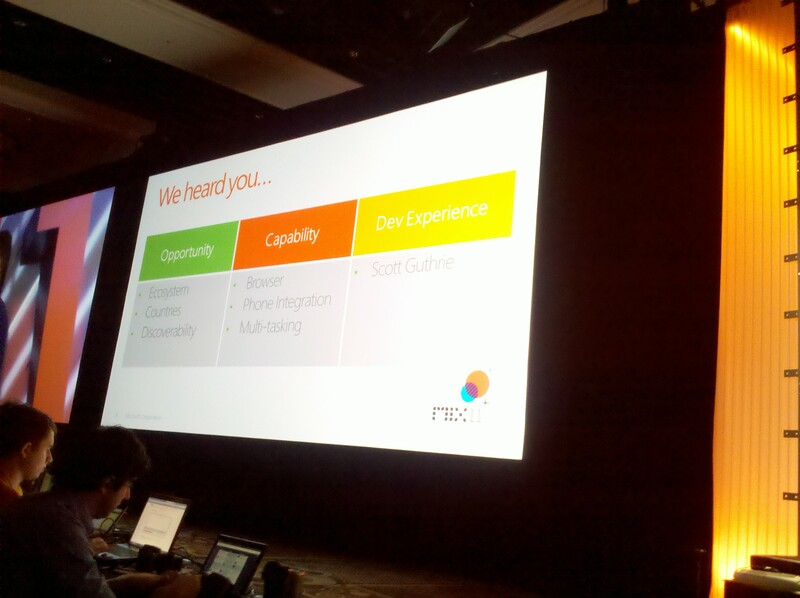 The new version of WP7 is going to be released this fall and its code name is Mango. Microsoft’s goal with this release is to allow developers to create better apps for users by enhancing the developer experience. Joe suggested that with this release Microsoft is taking another step towards creating a larger market from which users can select and install WP7 apps created by developers, and by increasing the number of people who get the apps, they’ll be creating an opportunity for WP7 developers. Joe Belfiore also commented on recent projections from IDC and Gartner that Windows Phone 7 would be the second largest phone ecosystem by 2015, due in part to Microsoft’s deal with Nokia which Marco Argenti, Nokia’s Head of Developer Experience confirmed and commented on at this keynote. With Mango, Microsoft is increasing the number of countries that will be able to submit applications, will support more languages and countries in general and the market place will be available in more countries for people looking to buy and download WP7 apps. Improved search and search results, most search results will have links to related information and other useful related data. IE9 will be the phone’s browser, allowing for HTML5 to run natively. Phone now supports browser background audio and hardware acceleration. Data access is now available with the introduction of SQL to WP7. Another cool and useful feature is the introduction of Amazon sensors, which basically allow you to scan a barcode from a book to then show you the book in the Amazon store. And for all the Angry Bird players (including myself), this popular and very cool game will be available for WP7 in May, as well as the popular application Spotify. Scott came up to the stage wearing a red polo shirt, I wonder how many of those he has… Scott started by talking about the new and enhanced WP7 emulator, which looks awesome and it is a long needed tool by all Windows Phone developers, great points on that one Microsoft! With this new WP7 emulator, you can even simulate a location which is very useful if you are developing a location-based application. This feature is very simple to use, you just basically pick a spot on a map and the emulator will set this point in the map as the current location. Also, the profiling support for WP7 development is great, it will come very handy when debugging and trying to find places in your code where you can do some optimization. John’s presentation was very brief but it included some great news for Silverlight developers. He mentioned that Silverlight 5 Beta will include support for binding debugging and access to the XNA API. This day 2 keynote finished with some demos of very cool projects using Kinect, which Microsoft is opening to developers by releasing a Kinect for Windows SDK later this spring. The Kinect projects demoed at the keynote are listed below and you can find more about them by clicking on them. That is all for this year’s MIX keynotes, I’ll blog about specific sessions I attended in my other blog, cheers!